For me, it's essential I have an email delivery the moment a user uploads something new. In the slide above, you can see my inbox, a large thumbnail and the video even plays right inside Gmail. If you are interested enough in a channel - why wouldn't you want to know as fast as possible? How else do you think I share stuff so fast? What people don't realise, this is so fast, you can often share a user's video before they can themselves. It takes time to think, edit and prepare a video - and so it should. 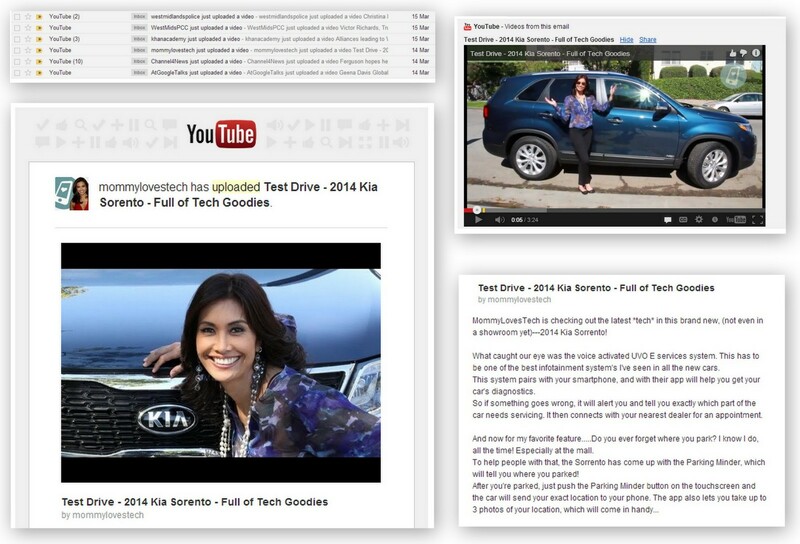 For example, uploads are usually part of a bigger strategy like embedding in a blog post. So, you get the message fast from an email and there's no need to wait a few hours or even days. Another great example, Hangouts On Air, as soon as they're ready you get an email. If I've missed the start of a show, I just wait.. get the email and bingo, never miss a thing. Along as you are subscribed and have the email button checked, it works every time. Step One Visit any channel and Subscribe. 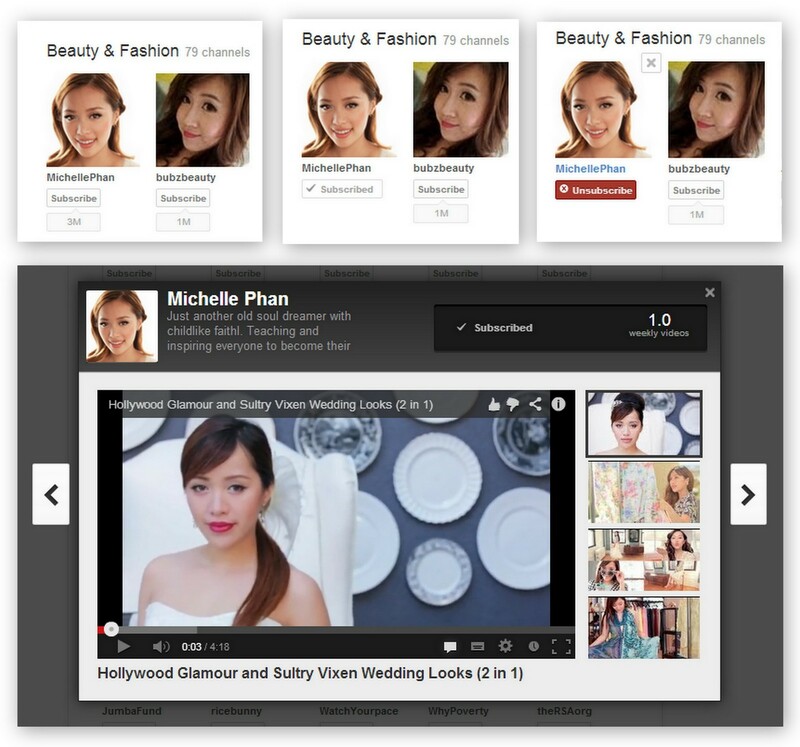 The slide on the left with Michelle Phan has a few buttons before and after (these buttons are everywhere). 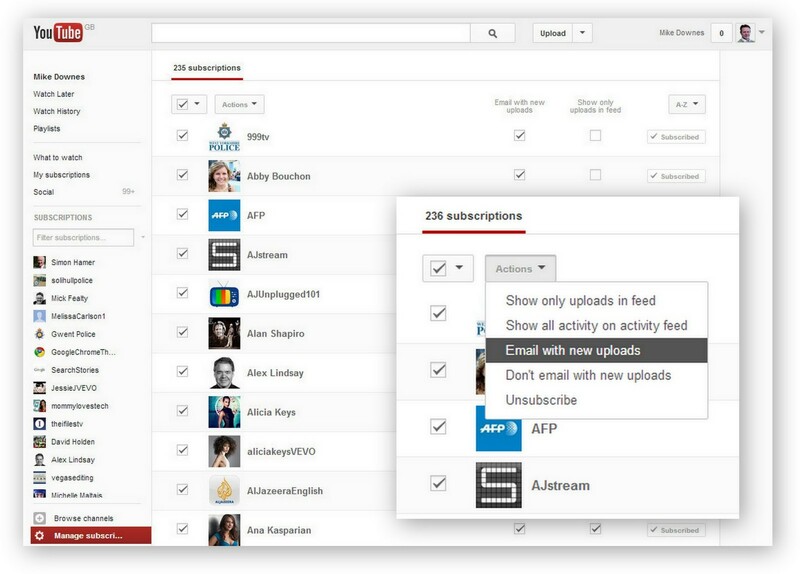 Step Two Manage Subscriptions, check those channels for email with new uploads (I have 236 channels on my list). Step Three is optional. You can check all channels and update (the slide above shows that in close up). Each page shows about 80 channels, so if you have many, like me, remember to go Next Page). The Subscription Manager lets you sort A-Z, New Activity and Most Relevant which is way handy as we all know some channels sit there in dust forever. alerts from the My Subscriptions tab. You need to hover over the area before the drop arrow appears. Slide on the right shows the four options.